Coal-fired power plants like this one in central North Dakota are located right next to mines. Efforts are underway here and in coal states across the country to develop "clean coal" technology. Coal states are pouring millions of dollars into clean coal research. The industry’s hoping not only to capture carbon dioxide created by burning coal, but find ways to put those emissions to use. In North Dakota, it was a hot topic at a recent seminar for teachers hosted by the Lignite Energy Council, the trade group for the state’s coal industry. With such long-term potential, the industry has no desire to stop mining anytime soon. But the way the state uses that coal will look quite a bit different down the road. The future, judging by current research efforts, lies in carbon management. “We’re looking at CO2 as a challenge, but also an opportunity,” said Mike Holmes, who oversees research and development for the Lignite Energy Council. The state government has poured $15 million into carbon research in recent years, with the industry and federal government adding millions more to projects in North Dakota and elsewhere. Most of these projects are in the early stages and will require a lot more investment before they’re ready on a commercial scale. 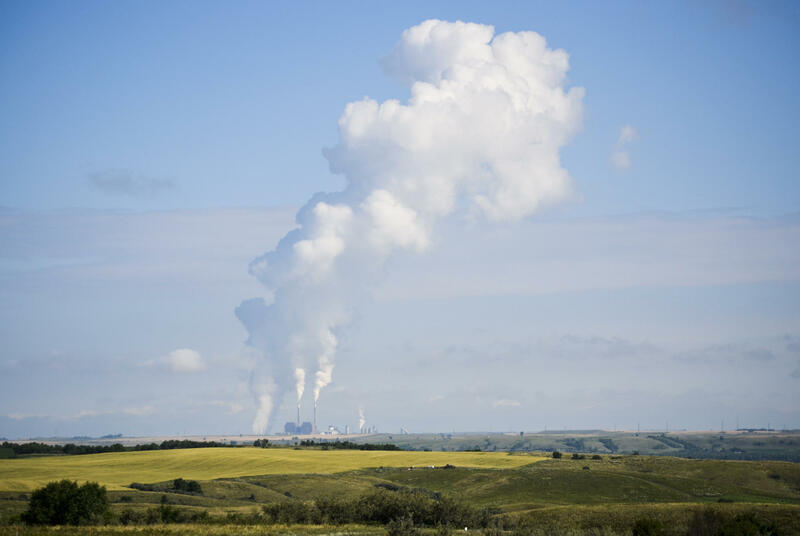 One of North Dakota’s biggest efforts is the Allam Cycle, a power plant that will capture the carbon dioxide it creates and use some of it to power the plant. But what about the rest, and all the other emissions from existing coal plants? One option is to store that carbon dioxide underground. At the conference, he told the teachers finding the right conditions is key -- the temperature and pressure below the earth's surface have to be just right. “We would have to have the right kind of rocks to store the CO2 in and a rock that would form a seal over that storage layer,” he said. What the coal industry’s really excited about is the other option: turning carbon dioxide into a moneymaker. Joan Dietz works with Basin Electric’s Great Plains Synfuels Plant that gasifies coal and turns it into various products. “Knowing that we probably will be in a carbon-constrained world going forward, we looked at it as an opportunity for generating more revenue,” she says. The plant captures half the carbon dioxide it creates. Some will soon be used to make urea, a type of fertilizer for farmers’ crops. The bulk of it will continued to be piped up to Canada, as has happened for years. It goes to Saskatchewan, where it’s sent down into old oil wells to boost production. There’s potential to do this so-called “enhanced oil recovery” in the Bakken. Holmes of the Lignite Energy Council sees a big payoff if researchers can develop the technology to send carbon dioxide into newly tapped shale formations. Even with fracking, oil producers can extract only a small portion of the crude in rock. By injecting carbon dioxide, it could increase the amount of oil recovered by a small percentage, which would have a huge effect. “It would double one of the biggest oil plays the United States has had,” Holmes said. Plus, it would help keep the demand for North Dakota’s lignite coal going for years to come. Other coal states like Wyoming are looking at new technologies with a similar goal. Phil Christopherson, CEO of Energy Capital Economic Development, was grinning and moving from one person on a recent morning. The Cheyenne, Wyoming, meeting room was packed, but he seemed to know most of the people there. His organization, which helps Gillette and Campbell County attract new businesses, just had a major victory. The State Loan and Investment Board agreed to spend $1.5 million to help build a new Carbon Products Innovation Center, something Christopherson’s organization has been championing. Christopherson said he expects coal to be burned for at least the next 20 to 40 years, but now is a good time to start fostering alternate uses for coal to keep the industry alive in the long-term. One way to do that is through the innovation center, which will act like a business incubator, fostering research and business ideas on how to make and market coal-based products. These will be products like carbon nanotubes, used in things like antennas and new battery research, and carbon fibers, which are used in high-end bicycle frames and new airplane wings. A company like Atlas Carbon is exactly the kind of business the new Center hopes to foster. “We need to be more thoughtful about what we do with the unique chemistry that coal provides,” said Jim Ford, Atlas Carbon’s chief operating officer. Ford’s company extracts pure carbon from coal and markets it to help clean water, air and emissions from coal-fired power plants. “One of the big advantages, I think, of developing advanced carbon-based products from coal is the fact that we have the coal right here, under our feet, in ways you could say an almost inexhaustible supply,” he said. Atlas Carbon is only three years old, and it just secured a $15 million loan last October from the state to expand its operations. But Wyoming isn’t putting all its carbon product eggs into one basket. The state is also spending $15 million to build something called the “Integrated Test Center,” in Gillette. Just down the road from Atlas Carbon, the test center is going to host the Carbon X-Prize: a competition pitting researchers from all over the world against each other to use carbon emissions from coal after it's burned and put them into a product. Wyoming, like North Dakota, depends on millions of federal dollars to keep all this research going. Despite the Trump administration’s full-throated support for the industry, the proposed energy budget slashes clean coal research by 85 percent. Coal state lawmakers vow to fight those cuts.